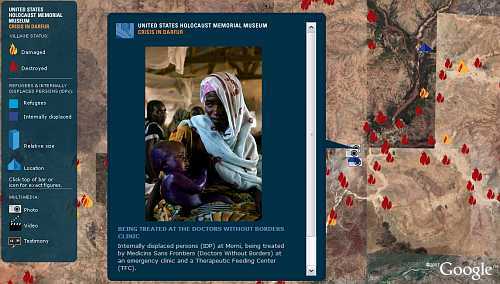 The new Crisis in Darfur layer, which was pushed out into Google Earth on Monday night (as first reported here), was formally announced on Tuesday in Washington, DC by the US Holocaust Memorial Museum and Google. Google has featured this layer as a new default layer (turned on when you first bring up Google Earth). The news of the new layer was picked up by major media sources all around the world (see a media summary - with links - of major news stories at OgleEarth). Over the coming days and weeks, the millions of people who have Google Earth installed will start up the application and discover the new layer. Even more attention and learning about this tragedy will occur. A version of this layer was first released back in February. Since February, an enormous amount of effort from people all over the world - who specialize in GIS and Google Earth content - was put forth to greatly enhance the Crisis in Darfur layer before it was released this week (see the credits at the end of this page). When the layer was released in February, it did not get much media attention. Although its truly a much better layer now than in February, it isn't the quality of the layer which has captured the attention. It's the fact Google got behind the layer, made it a layer turned on by default in GE - and joined USHMM in their press announcement. Now, it suddenly it gets major attention. In my opinion, if you have super-power brand name recognition, and an innovative application of information dissemination (Google Earth), then helping elevate attention to a crisis like the one in Darfur is a very good thing. My congratulations go to the team of people and organizations who helped create the Crisis in Darfur layer. But, my hat is off to Google for using their marketing power for good. Just to correct something, the AAAS project from February is not connected to Crisis in Darfur. We advised on their project as they have done for the Museum's, but ours is not an "enhanced" version- in fact there is no AAAS content in the layers. I don't think Google should use GE for political propaganda. More exactly, of course GE is a perfectly legitimate tool for implementation of political propaganda _by third parties_, but Google itself should not issue such propaganda overlays. I have now (at last) managed to turn Darfur off; but I note that it doesn't seem possible to eliminate it entirely, and I resent this. HERE HERE.... I agree with Thomas. I've spent the last 2 days trying to REMOVE DARFUR LEGEND!By the way, how DID you TURN IT OFF? I've even gone so far as to remove GE and ALL OF ITS FILES, and yet.... when I downloaded it again,a 'LIKE NEW' install...P.S. I STILL HAVE THAT &$# SIDEBAR COVERING the entire left side of my screen! Thus is just NOT COOL!!!! PLEASE... Does ANYONE know how to remove IT?? "My Places" folder under the "Places" pane. key, or select the Right Mouse Button to get a menu on the folder and then select "Delete". This museum cannot stop the violence. But through your good work, you're making it impossible for the world to turn a blind eye. Earlier I saw an exhibit that puts faces on the millions of men, women, and children who have been killed or driven into the desert. I also saw an interesting new venture that you've arranged with Google Earth. As a result of this partnership, millions of Internet users around the world will be able to zoom in and see satellite images of the burnt-out villages and mosques and schools. No one who sees these pictures can doubt that genocide is the only word for what is happening in Darfur -- and that we have a moral obligation to stop it.